The entire range of Mariotti products are specifically designed and constructed to operate in limited spaces while still offering State of the Art Technology, Ergonomics & Safety, Reliability, and High Productivity. POWER AND CONTROL - The AC traction motor eliminates brushes and many component wearable parts. This reduces your operating cost and maintenance compared to conventional DC motors. The AC motor provides high drive torque and allows for better control when reversing, braking or when operating on ramps and inclines. This feature enhances your lift truck’s performance and improves your operator’s “feel” of the forklift, resulting in increased operational productivity. Electronic control of lift guarantees improved, precise control of mast functions and reduces required energy. This results in less battery usage and longer run times. STEERING - The ME AC Series features a hydraulic controlled rack and pinion power steering system. This rack and pinion system was specially designed and engineered to replace the old hydraulic chain and sprocket gear system found in previous models. This type of power steering is found on most front-loading forklift trucks on the market today. It is however an innovation for trucks with capacities of less than 2300 lbs. Elimination of the sprocket, chain and hydraulic motor improves precision, reliability and reduces maintenance costs. This method also reduces your energy usage increasing your run time. ERGONOMICS & SAFETY - Although the ME AC is compact and agile, it has been designed to optimize on-board space and to offer your operator a comfortable, safe working environment. The truck is easily accessible and equipped with a fully adjustable seat. The steering column is also adjustable and is located on the cross member allowing additional foot room. The hydraulic operating levers are easily reached and ergonomically engineered to comfortably accommodate your operator. 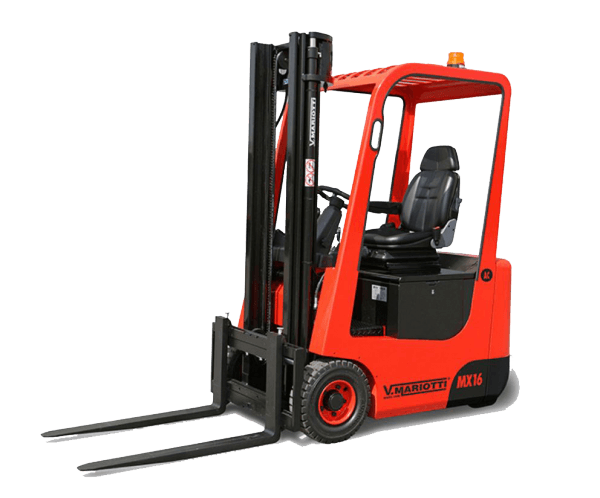 The adjustments described allow your operator to make the proper selections to allow maximum comfort when operating the forklift. The ME is fitted with hydraulic brakes and features two travel speeds, normal and slow, in which not only is speed reduced but also acceleration. All this increases control when maneuvering in tight spaces or working at considerable heights. AC TECHNOLOGY - Both the drive and lift motors are powered by a 48V AC system - a technology that allows for reduced maintenance and excellent operating economy in terms of energy efficiency and battery life - giving you increased up-time. The AC technology in the MX Series forklift includes Vehicle Control System (VCS) logic, a multifunction LCD display and two inverters that control the asynchronous motors. The various components communicate by using CAN-bus technology. This allows digital data exchanges and simplifies the electrical system by reducing the number of electrical cables. 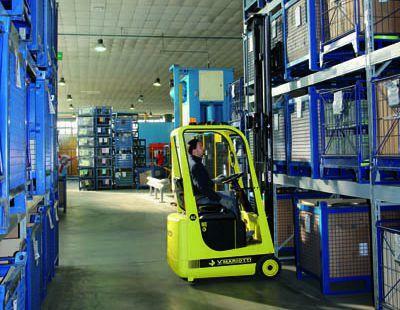 The result is a substantial increase in system reliability for your forklift. In addition to the constant control of all truck functions, the VCS system enables seamless and progressive engine power, dynamic acceleration, and smooth electronic braking. This AC technology improves your forklift's performance and eases your operator's work resulting in your operations increased productivity. 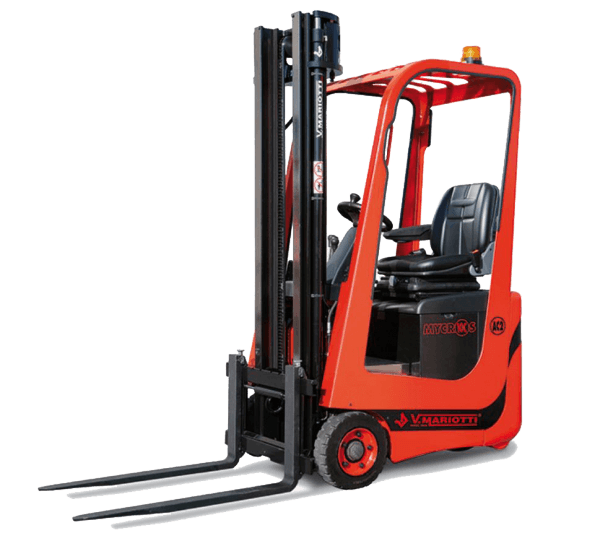 ADVANCED WHEELBASE FUNCTION AND MAST - MX forklifts are built with an adjustable wheelbase function that can be shortened when approaching the load by tilting the mast forward and reducing your forklift's turning radius. The wheelbase can be lengthened while carrying the load by tilting the mast backward increasing your traction and stability. The MX Series also has a Quick Change Mast (QCM) system that allows you to separate the mast from the front motors and axles, allowing for quick removal of the mast for easier maintenance. 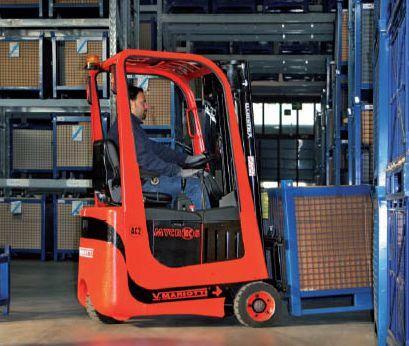 Furthermore, MX forklifts have integrated side shift and electronic lift which provides for more precise control of hydraulic functions and lower power consumption. CURVE SPEED CONTROL (CSC) - For improved safety, all MX forklifts are equipped with a Curve Speed Control (CSC) system. When turning, the CSC system will automatically change truck speed to meet the angularity of the curve, thereby reducing your forklift's risk of instability and load swaying. A state of the art LCD display provides information on the battery charge level, driving direction, speed, steering wheel position and speed (fast/slow) mode. This display is connected via CAN-bus to both inverters and the VCS, allowing a real time read into the status of the lift truck's components at a glance. The MINI AC Series consists of the smallest electric riders in the world. 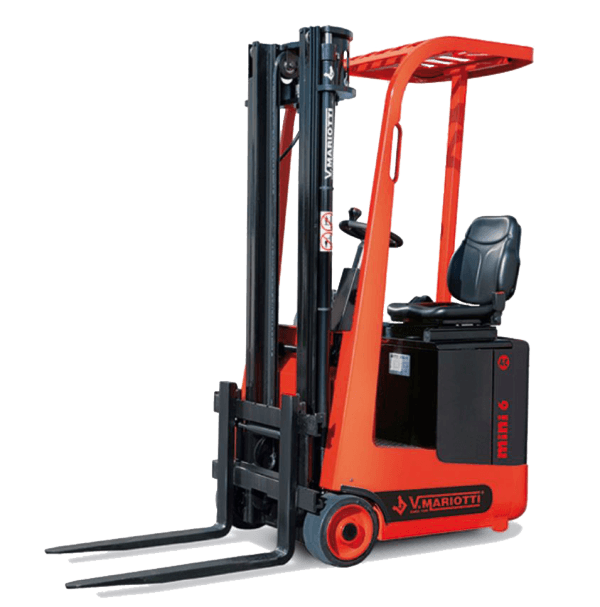 At just 43" in length, the MINI AC Series can operate where no other forklift can - without giving up features needed for an efficient, safe, and comfortable operating experience. AC TECHNOLOGY - A 24V AC system powers the drive motors of the MINI. This technology allows for reduced maintenance and is more economical in terms of energy efficiency and battery life. This AC technology improves the forklift's performance and allows for more operator comfort and safety - resulting in your operations increased productivity. STEERING - The MINI AC Series features a hydraulic controlled rack and pinion power steering system. This rack and pinion system is found on most front-loading forklift trucks on the market today, however is an innovation for trucks with capacities of less than 2300 lbs. Elimination of the sprocket, chain and hydraulic motor improves precision, reliability and reduces maintenance costs. Energy usage is also reduced. ADVANCED WHEELBASE FUNCTION AND MAST - The hallmark of all Mariotti models is the adjustable wheelbase function with the variable pitch. During the approach, the turning radius can be shortened by tilting the mast forward while approaching the load. The wheelbase can be lengthened by tilting the mast backward increasing your traction and stability. Full Range of Attachments Including Fork Position, Barrel or Carton Clamps and More! The MYCROS AC is a compact, three-wheel sit-down, electric lift truck which we have dubbed our "3-in-1 line". Available in rear-wheel drive, front-wheel drive, or all-wheel drive, the MYCROS AC can provide the needed traction for any application. AC TECHNOLOGY - Both the drive and lift motors are powered by a 36V AC system. These brushless motors have fewer parts which results in reduced maintenance and presents you cost savings compared to traditional DC motors. The AC motors are also more energy efficient giving you increased up-time with better battery life. The AC technology in the MYCROS AC Series forklift includes Vehicle Control System (VCS) logic, a multifunction LCD display and inverters (from two to four depending on the version) that control the asynchronous motors. All system's elements communicate by using CAN-bus technology. This allows digital data exchanges and simplifies the electrical system by reducing the number of electrical cables. 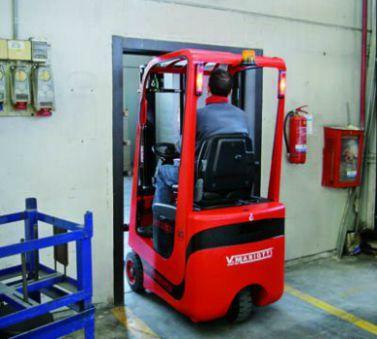 The result is a substantial increase in system reliability for your forklift. The VCS logic and the inverters constantly control all your forklift's functions and motor power is managed in a fluid and progressive way. Acceleration is dynamic and smooth and electronic braking recovers energy each time the accelerator is released. This AC technology improves your forklift's performance and eases your operator's work resulting in your operations increased productivity. ADVANCED MASTS - MYCROS AC forklifts feature an adjustable wheelbase function. 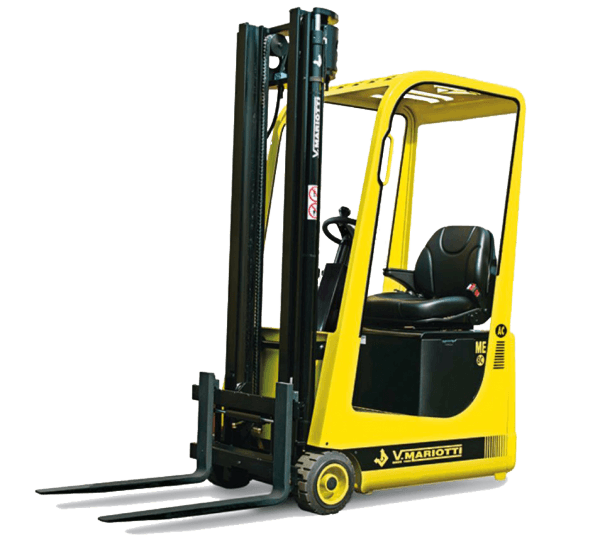 The wheelbase can be shortened while approaching the load by tilting the mast forward reducing your forklift's turning radius. The wheelbase can be lengthened while carrying the load by tilting the mast backward increasing your traction and stability. The MYCROS AC Series also has a Quick Change Mast (QCM) system. This includes separating the mast from the front motors and axles which allows for quick removal of the mast for easier maintenance. This patented feature is standard on all MYCROS AC forklifts. Furthermore, MYCROS AC forklifts have integrated side shift and electronically controlled lift which provides for more precise control of hydraulic functions and reduced power consumption. SMALL SIZE BUT BIG SOLUTIONS - A new compact rack & pinion steering system was designed specifically for the MYCROS AC replacing the hydraulic chain & pinion system of previous models. This new steering system provides driving precision, reliability and reduces power usage. CURVE SPEED CONTROL (CSC) - For improved safety, all MYCROS AC forklifts are equipped with a Curve Speed Control system as a standard feature. When turning, the CSC system will automatically adapt truck speed to the angularity of the curve reducing your lift truck's risk of stability loss and load swaying. A state of the art display provides information on the battery charge level, driving direction, speed, steering wheel position and speed (fast/slow) mode. This display is connected via CAN-bus to both inverters and the VCS. This blend of technology and graphics supplies the operator with real time information at a glance.